Pictures taken over the years in eastern Belgium, my usual hunting grounds. If you are interested in the area, check out Stefan Vonderruhren's web site. Click the info button underneath each picture for more details including a map with the location it was taken. 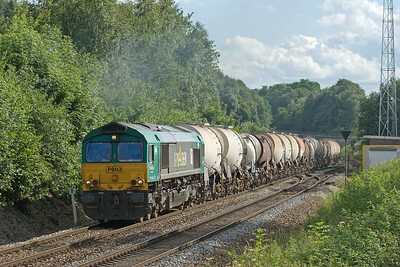 A freight train derailed several tank cars at tower 16 in Montzen yard on 10-Jul-2008. By dusk the hazmat cargo had been transloaded and rerailing operations were under way. Two class 77 diesels power FE 44522 (Gremberg - Antwerpen Noord) through Remersdaal. This was one of a handful trains in 2007 that operated with a single set of power all the way. Most other trains changed power in Montzen and again in Aachen West. Winter time - night shot time. 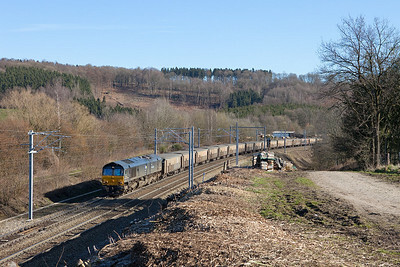 Here's 241 803 with a UK-bound train composed of ferry wagons in Montzen near tower 14. In the pouring rain. 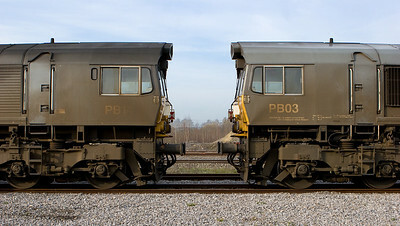 These units were transferred to eastern Germany in mid-December 2008. 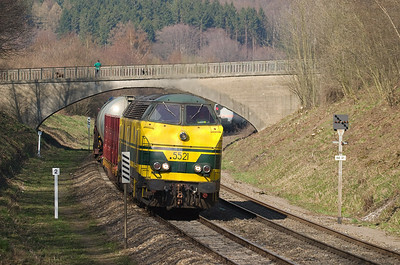 5505 brings the limestone train CS 48567 (Hermalle - Oberhausen/D) out of the Gulp Tunnel in Hindel west of Montzen yard. Routinely booked for a single class 55 unit this heavy train was the undisputed "audio king". The unit was in Run 8 all the way from Hermalle to the tunnel at Gemmenich, where the steep decent into Aachen begins. The Hindel interlocking received a sorely-needed overhaul in 2010 during which the picturesque little switchmans' shanty was removed. 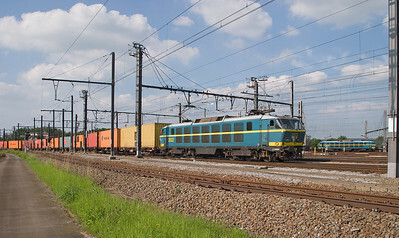 The StoraShuttle paper train between Zeebrugge and Köln/D was long a staple for DLC. 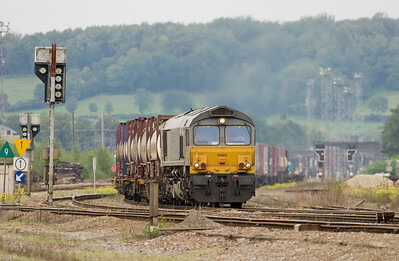 It was the heaviest train around and gave the class 66s a decent workout. Here's PB18 leading it through Montzen on a late summer evening. 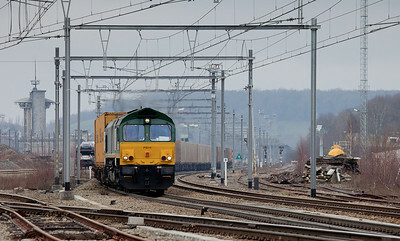 The way things were in Nouvelaar - two 55s bring an intermodal train westbound through the large cut between Nouvelaar and Rue d'Aix. The near slope was deforested less than a year previous. Nature was regaining lost ground fast, but shots of nice sweeping vistas like this were still possible until 2005. 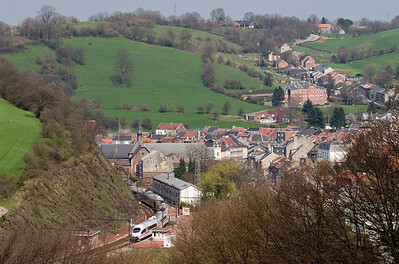 This shot was taken in 2009 just 300m further down the track, after Infrabel deforested the hillside again, in preparation for the electrification work. Foamer Central! Over multiple decades, more pictures have been shot from this bridge than anywhere else in the area, probably than in any other area of Belgium. Like this one. It was downright unreasonable to expect the bridge to be devoid of fans on any beautiful day. Few people actually shot the bridge itself, though, which is a pity as it's been replaced with this much larger structure in 2008 to make room for the catenary. During its construction in 1915, the self-supporting concrete technology used was groundbreaking. Needless to say this angle is now a mess of supports and wires and just about useless. 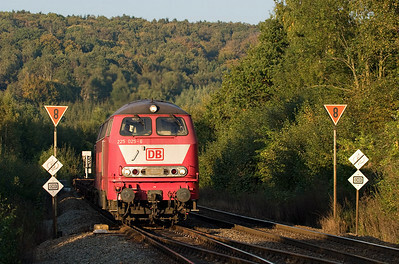 In better times (2004) 5521 brings a westbound junk freight up from Aachen as a hiker looks on. 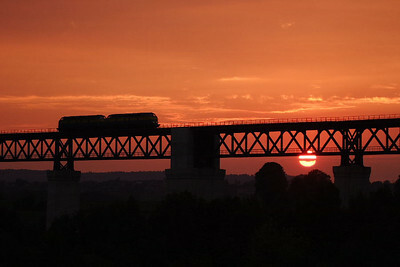 2 class 55s cross the viaduc de Moresnet and head to Aachen West light engine to pick up a train. 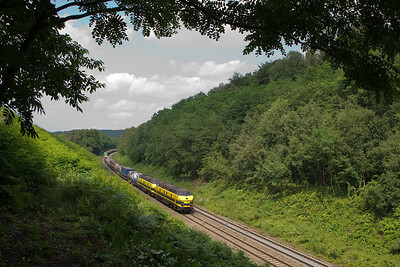 In a most unlikely setting for a high-speed train an ICE3 negotiates the sharp curve through Dolhain-Gileppe in the confined valley of the River Vesdre. The train is on its way to Paris/F Gare du Nord. 225 025 crosses from the German onto the Belgian network in the last evening light in Botzelaar. Tower 15 in Montzen was dubbed the "space station" by the locals due to its progressive design. Today it stands sentinel over a largely abandoned yard. In its heyday it controlled two humps and their associated trackage. Dirty road warriors DLC PB14 and PB03 stand face to face in Montzen, waiting for their next assignments. Taken 4.5 years after the previous photo and in virtually the same spot, DLC-successor Crossrail's PB14 brings a P&O intermodal past B16 in Montzen. The new catenary and rebuilt interlocking have altered the location quite a bit, but the traffic patterns are still very much the same. 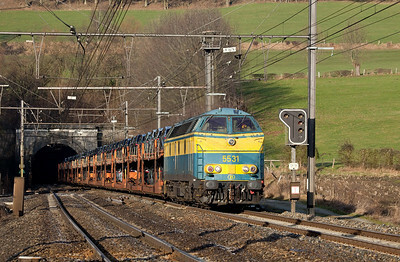 5531 with the Ford train 46511 (Genk-Zuid-Ford - Carimate) exiting the Gulptunnel in Hindel. The following weekend a new schedule went into effect, ending class 55 assignments on the L24 for the most part. 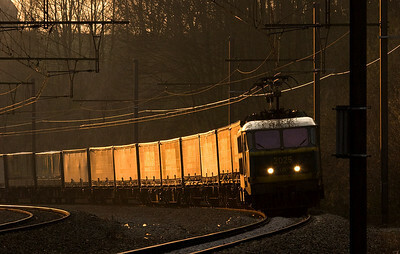 2025 brings an Ambrogio intermodal train east out of the setting sun at Remersdaal. 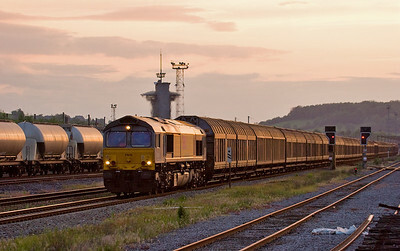 DLC DE 6303 powers a PET-train formed of empty EVS hoppers through Nouvelaar. The train has crossed over from track 'A' to track 'B' at Botzelaar, in the distance. 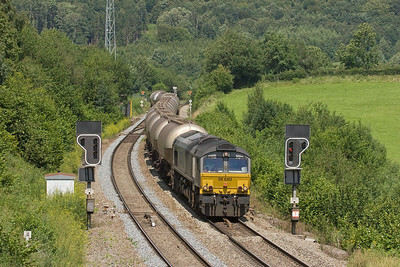 During 2007 Rail4Chem ran several trains per week carrying kaolin slurry between Antwerp and a paper mill at Rotkreuz/CH. Here PB02 has the honor, passing the old block station in Botzelaar. This was one of only a handful of R4C trains actually powered by their own locomotives within Belgium, and used to be a surefire Friday-after-work catch. 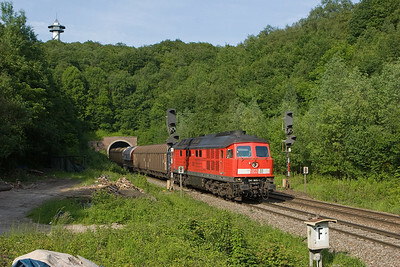 241 805 brings a freight westbound out of the tunnel at Gemmenich. The tower up top sits at the point where the Netherlands, Belgium, and Germany adjoin. The train has crossed from Germany into Belgium while inside the tunnel. The dirt road at left is part of the old original 1870 alignment of the railway line between Aachen/D and Welkenraedt via Plombieres. 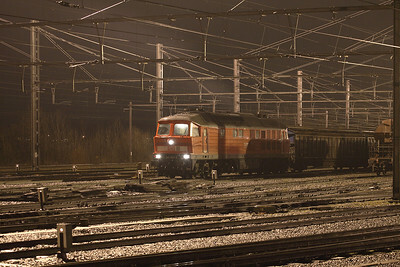 In early 2009 55s continued to ply the rails. 5505 and a sister have just exited the Gulp Tunnel and are running through Hindel with the FE 44563 (Kinkempois - Gremberg/D). This train usually has a class 28 electric for power. RTB/TSP MRCE 653-05 with the empty ore train 48510 (Stolberg/D - Lillo) in Botzelaar. In a classic scene from the year 2005, electric 2022 brings an eastbound container train into Montzen Yard while 2017 stands ready to depart with a westbound. Closing in on 30 years in service, the class 20s were the most modern electrics to routinely run into Montzen until the end. 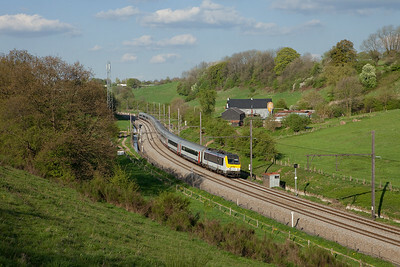 1349 with Oostende-bound IC-A descends into the valley of the river Vesdre near Heggen.